The historic Gokannapura is once again being vandalized by a gang of religious fundamentalists. Tribalism reigns, clearly. 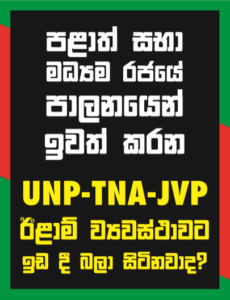 Religious extremism, which we have been taught to abhor and condemns, has raised its ugly head once again in what is today called Trincomalee. The law, apparently, does not have any currency in this area. It remains retired in the matter of application. The area around the Koneswaram Kovil is an archaeological site coming under the relevant statutes pertaining to construction. The archaeological record indicates that the historic Gokanna temple stood where the Kovil now stands. There’s heritage here that goes back to more than 18 centuries. This is why this is an area that comes under the jurisdiction of the Department of Archaeology.